For 8 years, SCI Foundation has sponsored cutting-edge surveys and studies on Marco Polo Sheep, perhaps the most iconic species in one of the most remarkable places on earth. 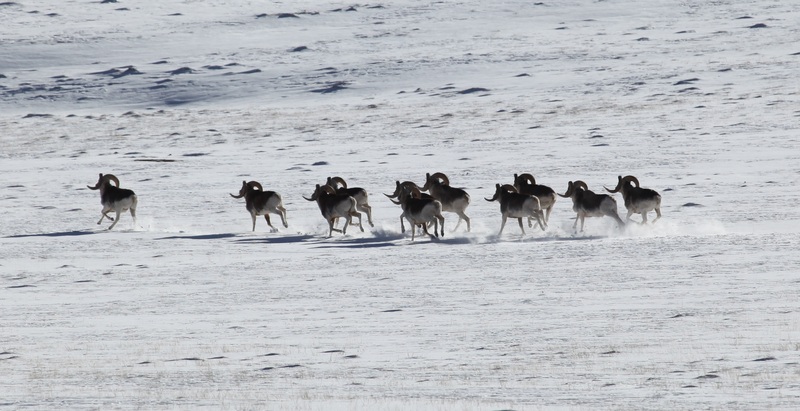 This ongoing study has three goals, develop models of present-day and potential future distributions of suitable environmental conditions for argali in the eastern Tajikistan mountains, compare how rapidly melting glaciers and permafrost impacts future habitat availability, and provide information of the diverse variables that could affect argali habitat. Eastern Tajikistan has the highest number of argali sheep in the world, with a minimum of 24,000 individuals in the Pamir region, an area famous for being the home of the Karakoram Pass, the Hindu Kush Mountains, and Sulayman Mountain just to name a few world-renowned sites. The study area for the Marco Polo Sheep Survey in eastern Tajikistan ranges from 14,700 to 24,000 feet in elevation, an altitude known as the, “death zone” among mountaineers. Winter temperatures hover between -15 and -20°C in January, making the high altitude and cold temperatures a perfect study area for high-alpine habitats. Tajikistan is deemed the main glacial center of Central Asia. As the primary sources of water in Tajikistan, glaciers which occupy over 6% of the country’s total area are a crucial source of nourishment for the lowlands and highlands alike. However, in this area known as the, “Roof of the World,” the massive glaciers and permafrost responsible for maintaining a healthy hydrological cycle are changing rapidly. As a result of lower seasonal snow packs, fresh water and soil moisture are in decline and it is affecting the wildlife and their habitat. The Marco Polo sheep share this region with just one other wild ungulate species, the Siberian Ibex. Their predators include the gray wolf, red fox, brown bear, and snow leopard. Together, these species share a fragile ecosystem that is forcing them to climb higher into the “death zone” in order to exist. According to our researchers, Marco Polo sheep will undoubtedly need to live at 22,000 feet year-round as lowland desertification continues. Severe flooding and erosion is forcing alpine is also forcing the desert-dwelling people to move up into current Argali habitat in pursuit of fertile pasture lands for their herds, which consist of sheep, goat, yak, and cattle. SCI Foundation and our partners are helping local communities benefit from the iconic Marco Polo sheep. However, in an area known largely for herding, this is no easy task. Combined with traditional knowledge and practices, making the turn away from herding and competing with the Marco Polo sheep to conserving and managing them is paramount. Stay tuned for more updates on how the most prized sheep species on earth can change the future and fortune of those who live in their habitat, both human and non-human. Just as the Markhor has empowered and encouraged communities in northern Pakistan, it appears the Marco Polo sheep can do the same.